Work has been crazy busy recently and due to the lack of staff members I’ve had to take residents to view new properties for them to move out into. Although it sounds exciting it’s not always the case, the last one I went to view however was in Kensington and Chelsea. It was so beautiful and blog worthy that it got me thinking; if I could have my very own blogger/Pinterest worthy house, what kind of things would I want in it? First things first, I need somewhere to relax and I can tell you for sure that I’d definitely have a corner sofa. I’m one of those people that can never sit upright when I’m watching TV so I need something I can cosy up on. I recently discovered Fishpools sofas and they literally have every kind of sofa you could think of. 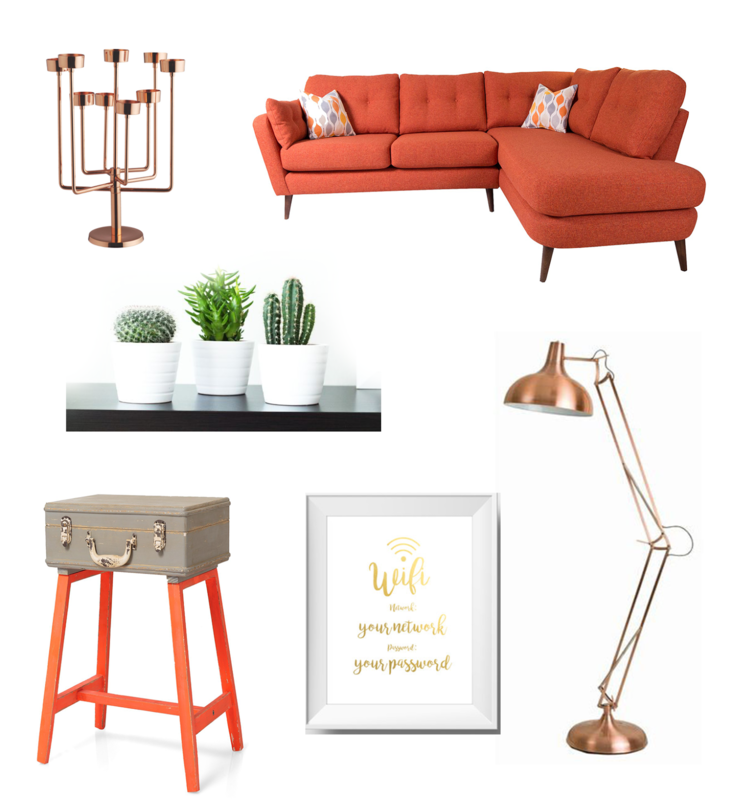 I couldn’t help have a little browse (which ended up a good few hours) on their website and I’ve definitely fallen for their fabric corner sofa in burnt orange. I’ll be honest I was actually looking for a marble topped table to add to my dream home mood board but then I came across this vintage inspired suitcase side table and knew I had to have it. Having loved it so much, I even went to go and see it in store at Oliver Bonas and as expected it’s super sturdy so you can put some stuff on top of it. The real clincher though is that the suitcase actually opens up and you can store all your important stuff inside. How cool is that?! I’ve always always loved anglepoise lamps. I remember having a white desk version and would entertain myself for hours with angling it and creating shadows on the wall. Fond memories, albeit sort of sad and in hindsight possibly slightly dangerous. Still, you can probably imagine my face the first time I saw a giant anglepoise floor lamp. I’m still on the lookout for a reasonably priced one but this copper one is one that I just keep going back to. I’m cheating a little bit now because I already have my next choice but if I move into my big dream blogger home one day *fingers crossed* then they’d definitely come with me. My tiny triplets aka my Ikea Cacti plants are adorable. They’re so low maintenance that even I can look after them. Plus I love how cute they look all in a row on my shelf ha. There appears to be a slight coppery theme emerging and so I’ve stuck with it and decided that I want a copper candelabra too. I love candles, everything looks so much more beautiful in candlelight and there’s something kinda majestic about candelabra’s. This mini candle holder is small enough to fit on a regular sized dining table making it a great centrepiece. Lastly, I’ve been searching for so long for the perfect print for my room. It’s difficult because I’m so indecisive and I just want something so perfect that it sums me up but it’s proving to be really difficult. For my dream blogger house however it was really easy. I’d definitely have the wifi password framed and up on the wall mostly because I want my house to be homely and home is where the wifi connects automatically right? What are some things you would have in your dream house?